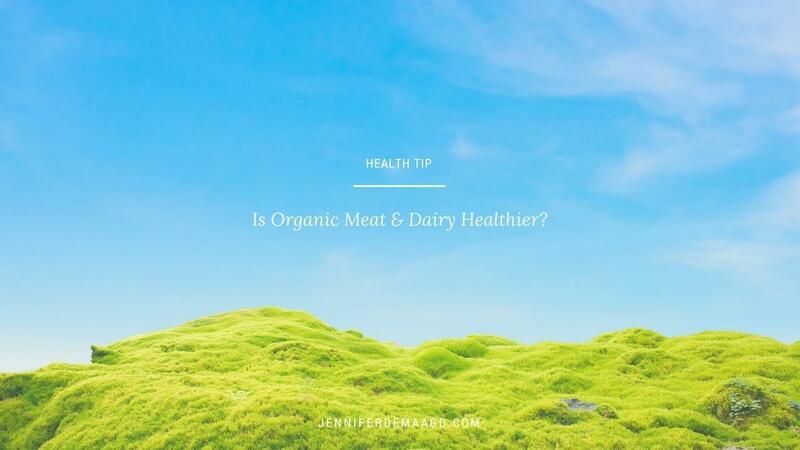 Is Organic Meat & Dairy Healthier? We’ve all been there at the grocery store. You’ve got the choice between regular old ground sirloin and Organic ground sirloin. The organic’s got to be better for you, right? In this case, I’m going to say “no”. Most of the meat (and dairy) in the US is from feedlot animals. What does this mean? These animals are raised in super confined spaces and are fed grain or corn. Organic meat is just fed “organic grain or corn” which is NOT the most important aspect for health. However, if your meat is fed grass, or is raised solely on pasture the nutritional profile is a 1 to 1 ratio of Omega-3 fatty acids to Omega-6 fatty acids. Omega-3 fatty acids decrease inflammation. Fish like salmon is high in Omega-3 fatty acids. Did you know that grass-fed meat is just as high in Omega-3 fatty acids as salmon? It doesn’t matter if your meat is organic if it’s grain or corn fed. When you’re buying meat (and dairy too) always make sure that it’s pasture raised or grass-fed. Also make sure to look out for meat that is raised on pasture, but is finished on corn. This causes the Omega-3 content to plummet and go down to zero. You want to make sure that it’s finished on grass, too. The fatty acid content is just 1 health benefit to grass fed meat and dairy. When cows eat grass, the milk they produce contains a substance called Conjugated Linoleic Acid (CLA). CLA has been shown to reduce the size of tumors. It has healing properties. If your meat is being fed antibiotics, it gets passed down to you. This kills the good bacterial flora in your digestive system. You won’t be able to digest your food as well and it makes you more susceptible to getting sick. If you’re going to eat meat and dairy, and you care about what is happening to your body (which I think that you do or else you wouldn’t be reading this!) make sure that your meat and dairy comes from grass-fed animals. Where do you find grass-fed meat? Check out your local health food store, food co-op, farmer’s market or local farmer to find grass-fed meat and dairy. Sometimes food companies can be a bit tricky and will advertise that their meat is “vegetarian fed” or “organic”. Make sure that you look for “grass-fed” or “pasture-raised”. If you go to the farmer’s market, ask the farmer. Ask what they fed their animals and if they’re finished on corn. If they are, there’s no Omega-3 Fatty acids left in that meat and it’s going to cause inflammation in your body. I like the brand “Organic Valley” for cheese and dairy. For yogurt, the brand “Siggi’s” is great. I also make sure to get the full-fat dairy and yogurt. Remember, small changes over time add up to huge results. Just the switch from conventional meat to grass-fed meat and dairy will make you feel better.